I tried to make a hundred-year-old recipe for Cranberry Tarts, but I think I actually made Cranberry Turnovers. Is there regional variation in the meaning of “tart”? I’m probably just looking for an excuse to justify my mistake, but I’m really hoping that someone other than me thinks that a tart is made by putting a filling in pie crust dough and folding it over. On Saturday morning, I made a tasty filling using chopped cranberries and raisins. I then hummed as I prepared the pie crust dough, rolled it out, cut it into rounds, put some filling on one-half of each round, flipped the top half over, sealed, and baked. The results were outstanding. The “tarts” were enticing with a wonderfully balanced filling that was slightly acidic, yet also slightly sweet. All was good. 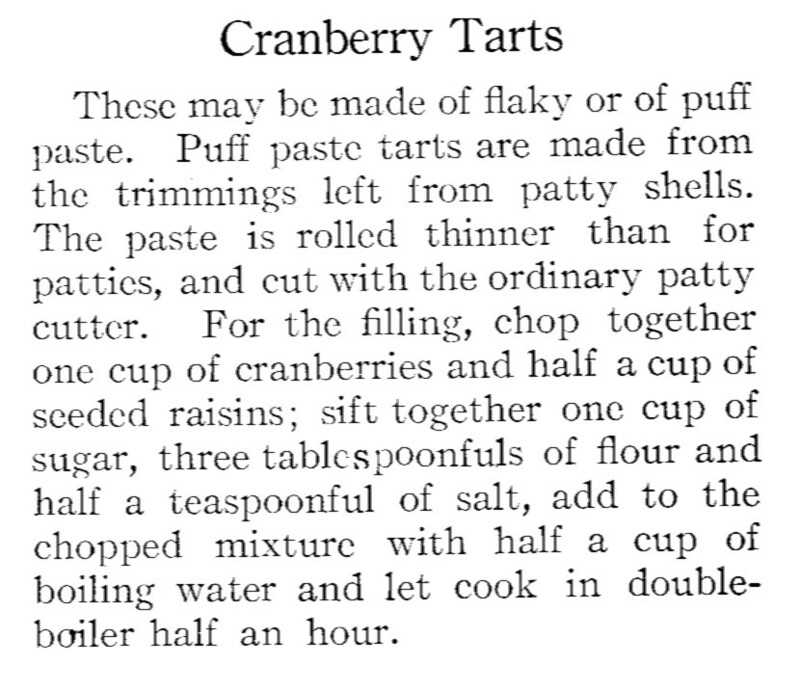 Then I decided to google “Cranberry Tarts” to see if there were similar modern recipes – and discovered to my horror that I had not made tarts, but rather that I’d made turnovers. My recipe success, suddenly became a recipe disaster. I’d misinterpreted the recipe. Put the cranberries, raisins, sugar, flour, and salt in a saucepan; stir to combine. Add the water, then bring to a boil using medium heat. Reduce heat and simmer for about 10 minutes. If the filling to too thick, add additional water. Remove from heat. Preheat oven to 425° F. If using pie pastry, roll until 1/4 inch thick, then cut int circles or rectangles. (I used an inverted cereal bowl to cut the rounds.) Place 2 tablespoons of the cranberry mixture on one side of each round or rectangle, fold the pastry over and press edges together. Put filled pastries on a baking sheet; brush with milk and sprinkle with sugar. Put in oven and bake until the top is lightly browned (about 20 minutes). Cook’s note: I needed to add about 1/4 cup more water than the hundred-year-old recipe called for to create a filling that had the typical pie-filling thickness. I also did not cook it for as long as the original recipe called for since it was so thick. Posted on November 5, 2017 November 4, 2017 by SherylPosted in FoodTagged cranberries, recipe. Next Next post: Wanted: Recruits for an Army of Kitchen Soldiers! I agree – The important thing is that they were tasty. Who cares what they’re called?! They sound delish, just the way you made them! I have never known the difference but your mistake looks like a real winner! Yes, it’s a winner. I’m glad that I’m not the only one who didn’t know the difference. Hmmm…these sound really tart. Were they? Would you add lemon zest to the berry mixture? Or allspice? No, actually it was much less tart than the typical cranberry dessert or salad. The sweetness of the raisins really toned down the tartness of the cranberries. Lemon zest probably would be a nice addition to this recipe. I’m not sure about allspice. I’ve always thought of tarts as open-faced, with a bottom crust. I’d call these turnovers — or, in the case of the Spanish/South American version common here, empanadas. But I agree that the naming doesn’t qualify as a “mistake.” It’s just different. A mistake would be forgetting to add the sugar! You’re right – it wasn’t a mistake. I’m struggling to find the right word. Maybe it was a misinterpretation. I’m still thinking about this, and finally went over to look at the etymology. “Tart” started out life (in the 13th century!) as a word for a flat, open-faced pie. What I’m thinking is that some people (who knows when?) began using the word for the folded-over version, too, because of “tart” taste. I suspect it’s just one of those regional differences in language that pops up from time to time. Think about “dumplings.” I grew up knowing that dumplings were fluffy, biscuit-like things that you dropped into bubbling liquid. Then I moved to Texas, where they believe dumplings are rolled and cut, like a noodle. What a shock that was! Wow, the 13th century was a long time ago. It’s amazing how long this word has been used. It makes sense that a different meaning of the word may have affected what type of pastry it described in some regions. Thanks for researching. 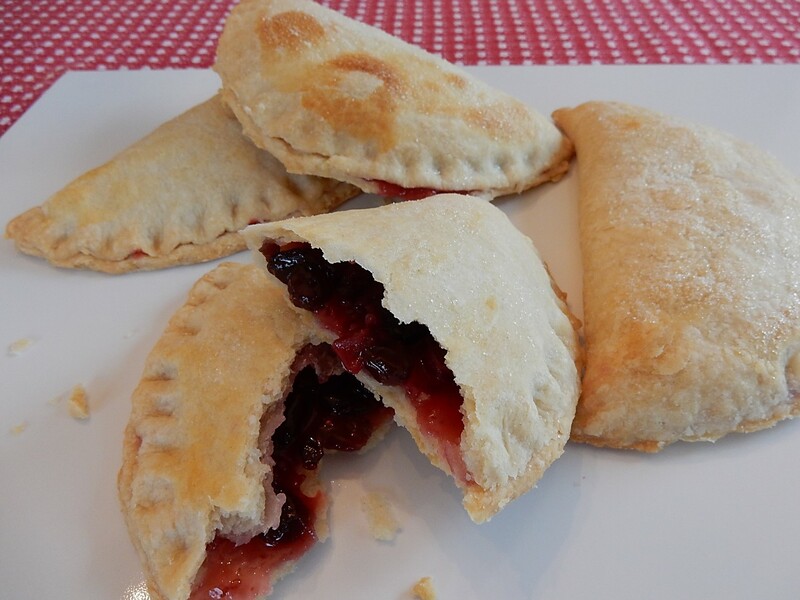 Tarts…turnovers….both are delicious and these look scrumptious! I like your easy-going approach. The name doesn’t really matter as long as it’s tasy. This makes me feel better. It’s good to know that historically the terms were interchangeable. No need to apologize. I do the same thing all the time. I can’t tell you how many times I’ve submitted comments on other people blogs with missing words, poor grammar, poorly thought out sentences, etc. A tart is a small pie with out top crust. You made wonderful had pies or turnovers. I like the recipe for the filling. I still have some frozen cranberries left over from last year. Thanks for the recipe. I am going to make this. Already booked marked. Thanks for explaining the difference. I should have done a little research prior to making the recipe. . .sigh. . . The filling is excellent. I think that you will really like it. Your dessert is beautiful, no matter what the name. I would have opted to make tiny pies, only because it would be easier than folding and crimping the pastry. This filling would look lovely in tiny pies. This is fascinating. Thanks for researching the meaning. It’s good to know that I was technically correct – at least for a given place and time. Maybe this basically means that I’m not keeping up with the ever-changing meaning of words . . . Sigh. . .It is interesting how language evolves over time. To me, it doesn’t matter whether they are turnovers or tarts…the look delicious! And perhaps the meaning has changed over the years? I agree, it doesn’t really matter what they are called as long as they are tasty. It makes sense to me that the meaning of the word “tart” may have evolved. The recipe wasn’t real clear on just how you should do the pastry….so I think you did a beautiful job of making what I would call a turnover,and I would also prefer a turnover to a tart. Looks and sounds like a real treat. Beautiful photo. 🙂 I like your new spin to the old saying. I could definitely polish off a few of those right now, yummy! They make a nice snack.